Trumpeter - He has no braiding on his coat and no sword. He does wear a sash, so must be a 'chief musician'. Drummer - Again this figure wears no braid but an officer's sash, allowed by regulations for 'chief musicians'. Prince of Orleans - Perhaps Louis Philippe Albert d'Orleans, a French royalist who was on the staff of General McClellan. Brigadier-General with a map - and sitting on a tree stump. Zouave with a wounded officer - actually a zouave sergeant. Nice little vignette. Major Russel B Shefferd - We think this should say Major Russell B Shepherd of 1st Maine Heavy Artillery, but the box is so full of mistakes that it is hard to tell. Colonel Ryan - Probably Colonel George Ryan of the 146th New York Volunteer Infantry at the Battle of the Wilderness. Joshua Lawrence Chamberlain - (1828-1914) Much respected commander. Flutist - Another musician with a sash. Why do they all have sashes? Wounded ADC - Doesn't look in the least bit wounded. Maybe he has a bruise on his arm. He is running and carrying a letter with a flourish! Young Flutist - At least this young man does not have a sash! General - He wears a waist-length double-breasted shell jacket. It's not in the regulations, but generals sometimes pleased themselves over uniform. Custer - George Armstrong (1839-1876). Cavalry commander who was made Brigadier-General at 23, but only for the duration of the war. Looks suitably dashing here. Colonel Colwill - our guess is this is meant to be Colonel William Colvill of the 1st Minnesota as he might have appeared at Gettysburg. Colonel Emerson Opdycke 125th Ohio - (1830-1884) Commander of said infantry regiment who had a distinguished war record. Here he is waving a pistol around by the muzzle - hardly a typical pose, but one that refers to an action during the Battle of Franklin in 1864. 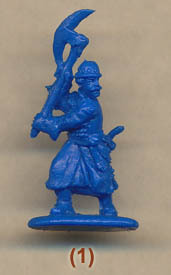 Eagle-bearer of 8th Maine - Another mistake. It was actually the 8th Wisconsin Volunteer Regiment that carried a live eagle as a mascot, which this appears to be. Very much a one-off figure, the perch looks nothing like photographs of the original although there may have been more than one design used during the war. This one doesn't give much protection to the bearer from discharge. Winfield Scott Hancock - (1824-1886) Much-admired commander who took part in several famous actions. Major-General Oliver O Howard - (1830-1909) Howard lost his arm at Fair Oaks in June 1862, but went on to command at Second Bull Run, Fredericksburg, Chancellorsville and Gettysburg. Since this figure is without his arm it is appropriate from that date onwards. Major-General Abner Doubleday - (1819-1893) Doubleday was one of the first participants of the civil war as he fought at Fort Sumter on the opening day. Ulysses S Grant - (1822-1885) Grant captured Vicksburg, which cut the Confederacy in half, and in 1864 was given command of all Union forces. In this figure he is in an uncharacteristically flamboyant uniform, which is not a good choice in our view. Col. Strong Vincent - (1837-1863) A hero of Gettysburg, he is here holding the riding crop his wife had given him and which he brandished at the action of Little Round Top where he received his fatal wound. An excellent and very appropriate pose. Col. Harrison H Jeffords (4th Mich.) - This gentlemen's sole claim to fame seems to be that he died trying to save his regiment's flag from capture. Ryan ADC - Who or what? Possibly taken from another Troiani painting ('Excelsior'), this time of the 140th NY Zouaves. He seems to be under attack from aircraft. Abraham Lincoln - (1809-1865) President of the USA and Commander in Chief of the Union army. In fairly typical dress here, and with a decent attempt at resembling the historical man. Well this has got to be the most surreal collection of figures we have ever come across. A smattering of actual commanders and an odd collection of junior officers, staff and speciality figures such as the eagle-bearer. It would seem that the sculptor took his subjects out of a book, probably by Don Troiani, which means that some of his subjects are of people most will never have heard of. Not so terrible if you own the book, but most customers will not, so they will be at a loss. Add to that the amateurish way in which the box has been set up, full of mistakes again, and you end up with a very strange set full of mystery. The sculpting of these figures is reasonable for Strelets, but in places detail is too thick and sometimes straps and other small items are incomplete. Flash is largely non-existent and there are no separate pieces to put together so the figures are ready to use straight off the sprue. Some of the poses are not too good such as the man with sword up under his chin while running (dangerous or what? ), but most are quite static and properly done. As for accuracy, well apart from our comments above, staff and commanders the world over tend to follow their own preferences there, and the Union army was built to save the union, not look good on the parade ground. Having said that we thought the Grant figure was most inappropriate, but we found no other accuracy problems, although we were not keen on the generous distribution of officer's sashes to all adult musicians. With such an eclectic collection of figures there are bound to be subjects that customers would feel have been missed out, but without worrying about which individual is represented by which figure this set provides a lot of material for the upper ranks of the Union army and should be very useful to civil war enthusiasts. However Strelets really must sort out the quality control on their boxes - at least get the name of the set spelt correctly.